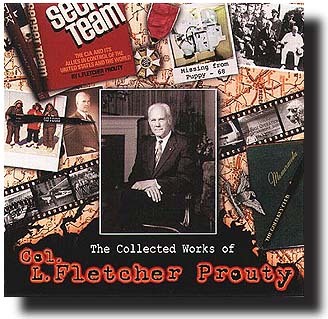 I'm pleased to announce that purchase of 'The Collected Works of Col. L. Fletcher Prouty' CD-ROM is now available via online secure credit card order! The CD-ROM will be delivered to you within 10 business days by registered mail. (Sorry, No P.O. Boxes) Simply click on the 'Purchase Now' text below, and you will be linked to the site where you can fill in your payment and shipping details. If you have any questions regarding this service, feel free to e-mail me. Also, you can visit the CCNow website, who assists me with this service. They also have a toll-free number at 1-877-CCNOW-77.